Join Dr Sumi Padayachee, a specialist Breast Radiologist and founder of ARYA STANA BONE & BREAST CARE, at the Artscape Women/Humanity Arts Festival on 8 & 9 August 2013 at 15hoo – 17hoo for a free talk on Breast & Bone Health. We at ARYA STANA BONE & BREAST CARE were inspired to give more than 67 mins of our time to help someone in need. 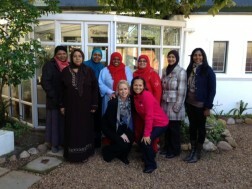 In collaboration with PinkDrive we gave 14 women from Athlone free MMGs, most of whom have never had a MMG before.